We are the School Council. Anyone who is a Council member should represent the school with the best behaviour, smartness and kindness to others. We have decided to have our meeting every two weeks, with Miss Guest. In our meetings, we have an agenda.This is a list of things to discuss. We will decide what actions we will take and who will be in charge of doing them. In our first meeting, we agreed and signed a School Council Pledge. The pledge is on the board next to the Heads' office so everybody can see it. We are sure that we will meet our aims for the year. This afternoon we have been busy with our publicity for our upcoming Easter events. We designed a poster and have delivered one to every child in school. The poster gives details about our non-uniform day on Friday 29th March and Pyjama Party on Friday 5th April. Please bring an Easter Egg or a donation for our tombola and raffle. These will be used as prizes in our Easter Egg Bingo on Thursday 11th April. We look forward to seeing you there! Today Freya and Jessica conducted a learning walk around the school. We visited Year 1, Year 3 and Year 5. In our next meeting, we will visit Year 2, Year 4 and Year 6. It was very interesting to see what it is like to be a learner in different places in our school. When we have observed all of the classes and visited Nursery and Willow Class, we will write our findings and give feedback to teachers and the children too. 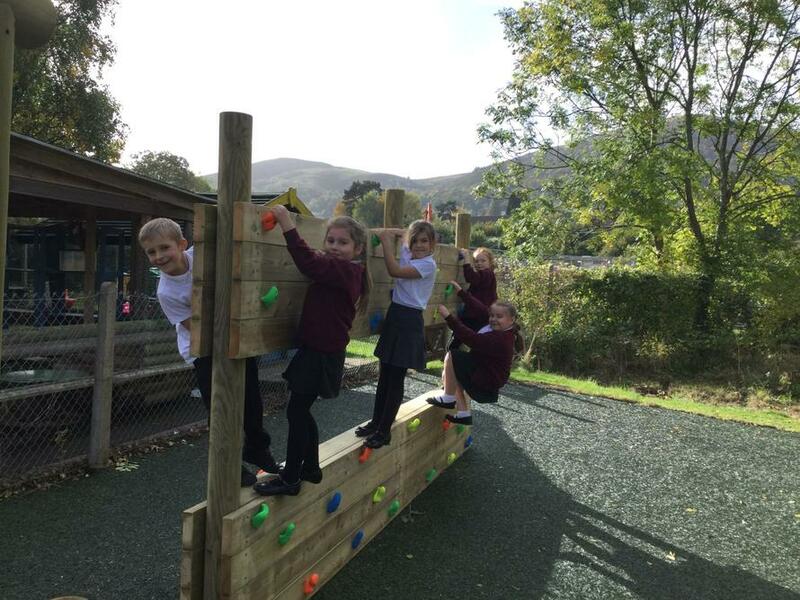 We will then go back later in the Spring half term to see if any changes have been made or to see if any good learning and teaching ideas have been shared. In today's meeting we evaluated the School Council Superstar 'Christmas Craft' session. We all thought it was a great success. To make it better next time, Ben thinks that we should choose different people. Chloe thinks that we should have it in a bigger space to work in. Jess suggested that we should choose less children so that everyone gets enough time at each activity. We look forward to running an Easter Extravaganza to celebrate the next group of School Council Superstars. This term, School Council children have an important job. We are going to answer the question 'What is it like to be a learner in our school?'. We are going to visit different classrooms to find out what learning looks like and how we can make school better for everyone. We have made a timetable for who we are going to visit and when. We will report our findings back to the teachers and children in each classroom. Every class in school voted for two children that had been Super Stars during the Autumn term. The children were voted for showing kindness and co-operation. They were hardworking, good listeners and well behaved. Along with the school council members and the ALWAYS children, they had an afternoon of festive fun crafts and decorated a biscuit, made a Christmas tree and designed a bauble. Everyone had a super afternoon. Festive Fun - Arts and Crafts. Wednesday 28th November FESTIVE FUN ALERT! We are running a competition! 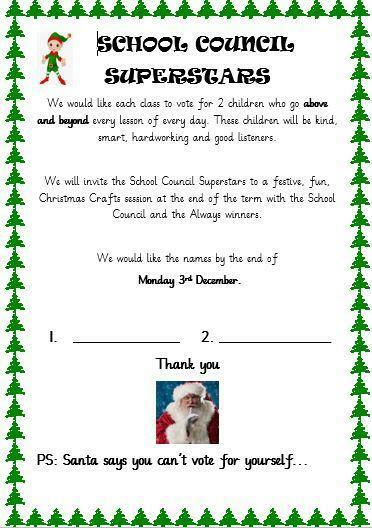 We have asked every class to vote for 2 School Council Superstars. These stars will have shown the best standards of behaviour, learning, listening and hard work. These superstars will take part in a Christmas Crafts session with Miss Guest, Miss Newton Smith and the School Council. We can't wait to find out who will be joining in with the festive fun. This week is Anti Bullying week. We have an Anti Bullying Policy and it can be found in the Behaviour section of our website. It is written for children so that we can all understand that bullying is Several Times On Purpose. Our value this half term is kindness. We will be learning about how kindness is catching. Thank you to everyone for playing the National Lottery. 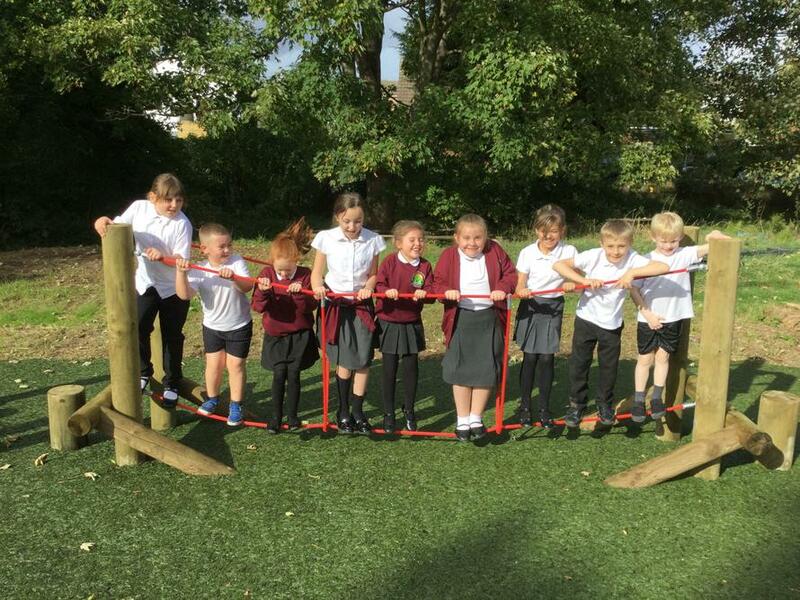 The safety checks on our new playground are complete so today we made a timetable. It was very complicated! We wanted to make sure that every class has a go. Friday is a special day because the entire Cheeky Monkeys area is reserved for our Certificate Superstars. In the next whole school assembly we will tell the school about the timetable and also share the rules for using Cheeky Monkeys. We were happy to try the equipment out... We wondered if people on the hills could see us. 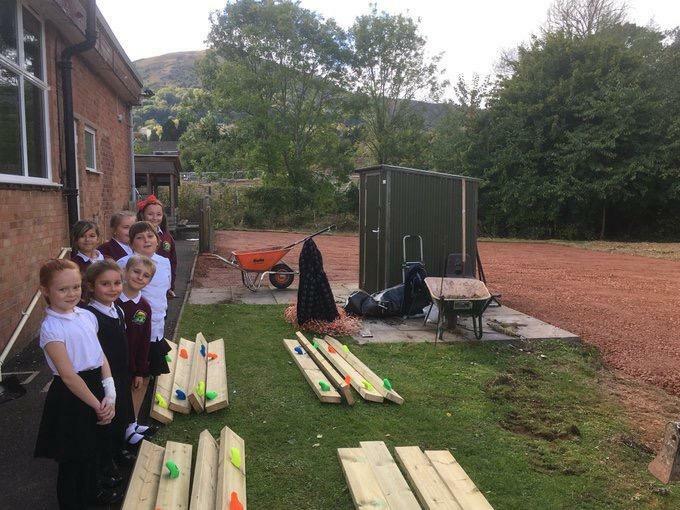 In our meeting today, we went to our new school garden and checked out the new shed. Thanks to Speller Metcalfe! Then, we went into the new playground works zone and spoke to the builders. We also had a look at the work so far. They have started building a multi-coloured rock climbing wall and have cleared the entire area. The big equipment has been delivered and will be put together soon. We think that when it is finished, Friday playtime will be just for the people who have received Praise Assembly certificates.